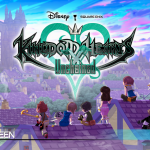 Kingdom Hearts Unchained χ was first revealed in May 2015 and later announced for an English localization at E3 2015, but for almost a year there was very little news about the game and when it would come out. Concerns grew for the state of the game as the months passed. Thankfully, Square Enix surprised fans this past Thursday by finally releasing the game in North America! 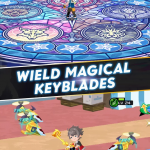 Players have the chance to jump into the very beginning of Kingdom Hearts’ story as a new Keyblade Wielder fighting against the Heartless to protect the light. 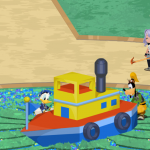 While traveling to various Disney worlds and meeting familiar characters like Mickey, Donald, Goofy, Aladdin, and Alice, players can also dive into a mystery that will lead up to the events of the ancient Keyblade War. 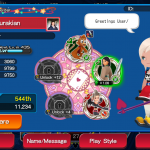 Back in September, I started playing Kingdom Hearts Unchained χ when it was first released in Japan, but quickly gave it up so I could eventually enjoy the English version without having spoiled the experience.. Now that the English version is finally out, I have been taking my time to play through various quests to get a feel for the game and have been pleasantly surprised by how much fun I am having. 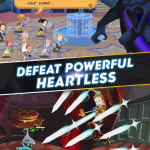 As an online social mobile game and the eighth installment of the Kingdom Hearts franchise, Unchained χ seems like it wouldn’t be a game many would want to play – but it is the complete opposite. Unchained χ is easily accessible by long-time fans of the series and newcomers due to the simplicity of the story it is telling. The story itself is rather self-contained, lightly drawing from elements introduced in other Kingdom Hearts games due to how far in the past it takes place, but it also has direct ties to the highly anticipated game Kingdom Hearts III and the future of the series. 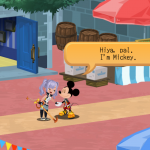 What those ties are remain unknown at the moment, but as Unchained χ’s story progresses it will certainly shed some light on how important it is to the overall story of Kingdom Hearts. 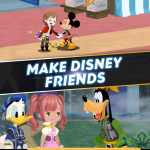 The first thing fans will notice when they boot up the game on their mobile device is the unique art style that Kingdom Hearts Unchained χ uses. 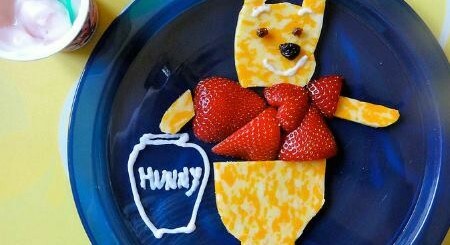 It is a big divergence from the style of the previous games, adopting a more simplistic and frankly adorable take on iconic Disney characters. 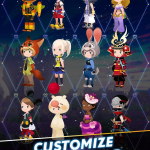 There are also a plethora of costumes that players can unlock and adorn their avatar in based on popular Kingdom Hearts and Final Fantasy characters as well as costumes from popular Disney films like Zootopia and 101 Dalmatians. 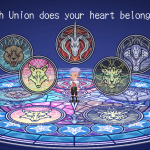 When you start the game you are asked to join a Union, one of five factions that are led by five Foretellers: Anguis, Leopardus, Unicornis, Ursus, and Vulpes. 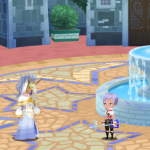 These Foretellers are Keyblade Masters striving to collect the light—or Lux—in order to save the world from the threat of Darkness overrunning them. Unchained χ doesn’t offer any explanation for what makes each Union different, so the player is free to choose whichever one they want. I decided to choose Unicornis because Unicorns are cool. The combat system in the game is very basic. 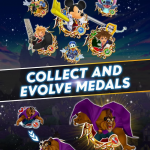 You equip a set of medals—either power, speed, or magic depending on the quest—to a Keyblade and fight Heartless in different Disney worlds. By tapping on one enemy, you can deliver a powerful blow to them, and by swiping the screen you can attack all enemies in a battle. 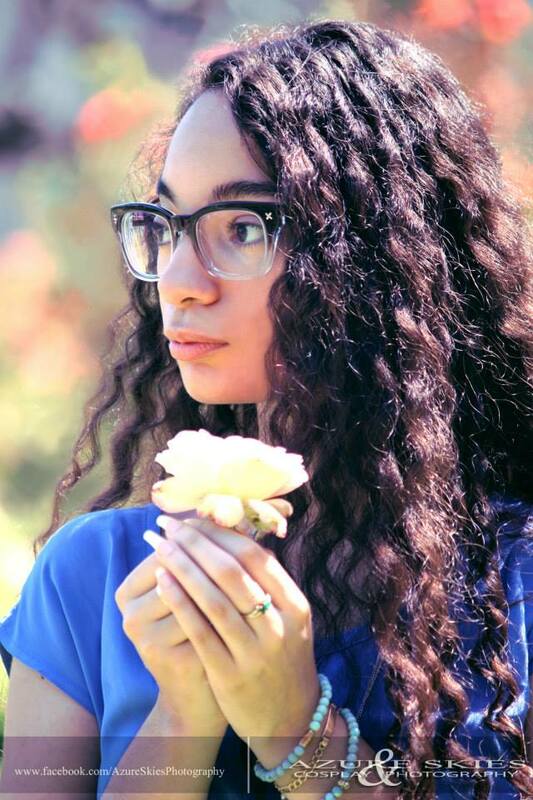 The goal of combat is to try to defeat all of the enemies in one turn in order to complete objectives (i.e. “Use only power medals” or “Defeat all enemies in 1 turn”) and gain massive Lux bonuses that will raise your avatar’s level and rank up. There are not only quests that can be completed, but raid bosses will also appear every now and then and sometimes require you to belong to a party in order to take them down within a given time limit. Party management is one of the ways the game integrates the social aspect due to the chat function with its own fun sticker collection for lighthearted conversation and also helps with the need to coordinate strategies with your party members. You can also approach the game in a more casual manner, only taking on the basic quests to enjoy the story. While the game is simple to play, Unchained χ has a rich and layered growth system that will have players spending hours working on. 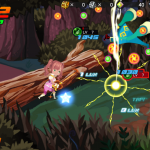 Your medals are the key to winning battles, and without powerful medals you can find yourself hitting a wall later on in Unchained χ. The only way you can increase your attack and defense stats is by leveling medals up and evolving them. 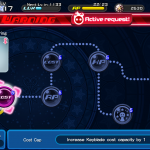 There are medals to boost levels, to gain new skills, to decrease the cost of a medal in your deck, and you can even sell Moogle medals to gain “munny” which is necessary to pay for all of your medal upgrades. 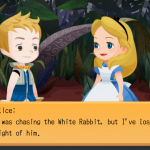 In order to increase your health points (HP), Keyblade’s medal capacity, and Action Points (AP), you will have to earn Avatar Coins which are spent on Avatar Boards, the source of your costumes in the game. Each node on a board has a specific costs and increases as you progress through the game. There is also the matter of gaining new medals. Many medals are often earned by completing quests, but there is also a medal shop where you can spend Jewels to pull for new medals at random. For 300 Jewels you can pull for one medal at random, 600 Jewels for the daily 3-medal pull, and 3000 for 10 medals. Jewels can also be spent on obtaining special costumes, refreshing your AP, expanding your medal storage capacity, and even for reviving yourself after dying during a quest. I’ve barely scratched the surface of Unchained χ’s story, but what I have gotten the chance to experience has been extremely enjoyable. 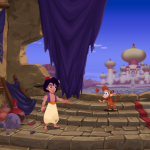 Exploring the desert sands and running into Aladdin, finding all of the missing dwarfs from Snow White and the Seven Dwarfs, laughing at Donald and Goofy’s antics, and dressing up my character have been one of the many highlights of playing and I do not see myself giving up this game anytime soon. 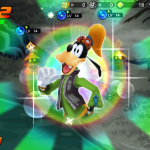 Kingdom Hearts Unchained χ is available now for free on Android’s Google Play Store and Apple’s App Store.